[en][coding] pngmerge -- composing APNG from PNG images. After 3/21/2009, I've written a python script to compose APNG from PNG images. This is just a stand-alone script using only native python functions. The code is on http://kichiki.web.fc2.com/pngmerge/. 21 May 2008: After maintaining the patch for a year I've decided to move on to other things. Hopefully someone else will continue to update it for new versions of libpng. [SF][en][phys]RYUON-stokes: Two movies of "Dancing Particles in Shear Flow" are added in visualization of RYUON-stokes at here. 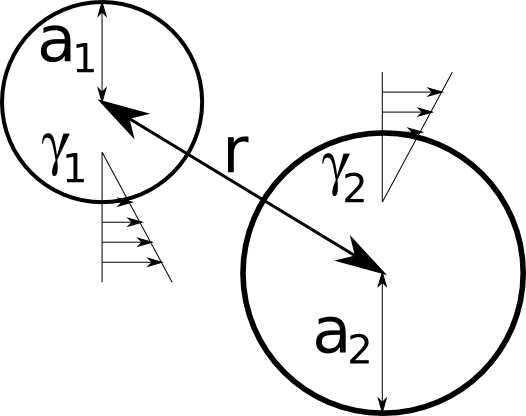 1) 6 particles initially on circle under simple shear flow. 2) 10 particles initially in line under simple shear flow. 3/14/2009: yet another thing to do.